This tool allows you to create custom materials ranging from a simple product list to a mini-catalog with Spec Sheets. Your product lists can then be saved as a PDF, emailed or printed so it’s the perfect solution for projects requiring a Bill of Material while developing bids. For added convenience, our Product Listing Tool is available on every product detail page on Leviton.com. Just click the “Add to Product List” button on the page and you’re on your way! Searching for Leviton part numbers has never been easier. We offer two options on the Leviton.com home page: the familiar Search bar or our new Cross Reference tool which is located at the very top of the page. Type in a competitor’s catalog number in the Cross Reference tool and hit enter, and all available Leviton products will appear along with a hyperlink directly to their individual page. The Home Solutions site is an interactive and informative way for you and your customers to see the latest and most innovative electrical products and how they apply to each room within a home. Use the site to present upgrade options to end users so they can visualize how each device will add safety, convenience or energy savings to their home and lifestyle. 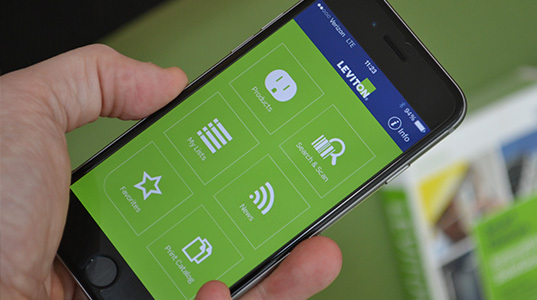 Our Leviton2Go app allows you to search through over 25,000 Leviton products, utilize our competitor cross reference tool, view downloadable PDF's, get instant live Leviton news notifications and more! We also have a number of specialty apps on specific topics like Title 24 and our popular Captain Code. Easy to download and clearly labeled, our apps bring everything Leviton directly to your smart phone or tablet. Keeping up with the National Electrical Code®(NEC®) is mission critical for Electrical Contractors and all electrical professionals. Since the NEC is revised every three years, you need to know what changed, how it impacts your work and what the appropriate product solutions are for compliance. The solution is here…Leviton’s Captain Code Program. Leviton has partnered with the National Fire Protection Association (NFPA®) and the International Association of Electrical Inspectors (IAEI) to provide quality Code analysis. Captain Code materials are available in 3 ways for 2 Code cycles – App, Portal or hardcopy Guides. The Leviton ez-Learn™ library of courses has something for everyone. From basic wiring devices and lighting controls to electric vehicle charging and home automation, ez-Learn does exactly what the name implies – makes it easy to learn a new topic or brush up on what you already know. With over 400 videos available at the click of a mouse, you are sure to find what you are looking for. Need some guidance on an installation? We have a video for that. Have a question on new technology? There’s a video for that too. Promoting your company is an essential part of doing business. To assist your marketing efforts, Leviton has developed several programs that can help. Utilizing these tools aligns you with a nationally recognized manufacturer – a distinction which could help position you ahead of your competition. Browse through our collection of brochures, direct mail pieces, truck signs and more. Sign up to receive the latest product information and news from Leviton delivered straight to your inbox, here. It’s a fast and easy way to keep up with the newest technology, Code compliance options, industry news and more. Take advantage of Leviton's comprehensive Technical Support System. Our on-line representatives and phone-based TechLine, available 7 days a week to help you with product and technical inquiries.